The Canon Refurbished ("Recertified" to be politically correct) inventory at Adorama has been refreshed. At this time, many of these items are PowerShot cameras and printers/scanners, but it is worth a check to see if the DSLR/lens/flash you are looking for is available. The new 5D II firmware announcement was not the only good news I received yesterday. Upon arriving home last night, an excited family greeted me with "Did you see what came today?" 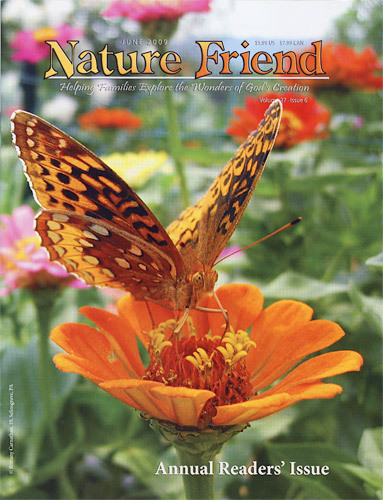 I of course had not, but was promptly directed to the latest issue of "Nature Friend" magazine on the counter. The cover photo had been taken by my 10 year old daughter Brittany. Congrats Brittany - Dad's excited for you! While we're on the topic of kids and photography ... The kids and I will quite frequently go shooting together. It gives us fun family time capturing images together and then again later reviewing what we've captured (when they also learn to improve their photos). The fun continues as the selects then become part of the screen saver slide show that often plays during meals and at other times. The kids have been starting out with lower end Canon PowerShot point and shoot cameras and, as they prove themselves responsible, move up to better cameras - including the Canon EOS Rebel XS / 1000D. This little DSLR with a light IS lens is working very well for their small hands and relatively low strength. The kids are having fun and learning a worthwhile skill. And now Brittany is earning some $$. Canon USA has announced a Canon EOS 5D Mark II Firmware Update scheduled to be available in early June. Get this: Included in this update is manual video exposure control. In perhaps the most dramatic firmware update annoucement I've seen from Canon, a Firmware Announcement PDF is available. Awesome! Adobe Camera Raw 5.4 (Release Candidate) is available for download. Support for the Canon EOS Rebel T1i / 500D DSLR is now included. ISO 12233 chart results from the Canon EOS-1Ds Mark III have been added. A focal length range example/comparison has been added. Canon USA has issued a service notice for Canon EOS-1D Mark III and Canon EOS-1Ds Mark III owners. We have discovered that images taken by some EOS-1D Mark III and EOS-1Ds Mark III digital SLR cameras may exhibit ring-shaped spots. We would like to convey the details and our service policy. Images taken may exhibit large ring-shaped spots. These ring-shaped spots are the images of oil lubricant on the surface of the low pass filter (LPF), which is located in front of the CMOS sensor. This oil is used inside the Mirror Box to lubricate some of the camera's moving parts. If the oil is applied too liberally when the camera is manufactured, it can become scattered onto the surface of the LPF through normal camera operation. The image above shows the top of the mirror box when the main mirror is flipped up. The white spots in the red circles are excess lubricant oil. We ask that customers who are encountering this phenomenon or, who have noticed that oil is visible on the surface of the back side of the mirror, please contact our Customer Support Center. To prevent oil from scattering, which may seriously affect images, our Customer Support Center will arrange free cleaning of the mirror box to affected customers to remove the excess oil. Measures are being implemented to control the amount of lubricant applied during manufacture in order to reduce the occurrence of oil spots. However, because this lubricant is required to ensure proper operation of the camera's precision mechanical parts, it is impossible to eliminate all instances of oil scattering. If you require CMOS sensor cleaning, please contact our Customer Support Center. Thank you for your patronage and support of Canon products. Click here for support options and hours of operation. I can tell you from experience that getting this oil cleaned off the sensor until it no longer continues to be splattered there (or transfered there from a sensor brush) can be extremely frustrating. I welcome the attention Canon is paying to this issue. Getting the Canon EOS Rebel T1i / 500D DSLR Review started - I have posted a high ISO noise comparison between the T1i/500D, 50D, XSi/450D, XS/1000D and the 5D II. The above-ISO-800 noise comparisons between the T1i and the 50D may surprise you. ISO 12233 chart results from the Canon EOS-1Ds Mark III have been added. Near record-setting is the combination of corner softness (check 50mm), distortion (both barrel and pincushion) and CA (check 200mm) this lens delivers. B&H has the still hard-to-find Canon LP-E6 Battery in stock. Chuck Westfall's May Tech Tips are online at TheDigitalJournalist. Gone: B&H has the Canon EF 24mm f/1.4L II USM Lens in stock. ISO 12233 chart results from both the Canon EOS-1Ds Mark III and the Canon EOS 50D have been added. A focal length range example/comparison has also been added. A Photography Gear Buy & Sell Forum has been added to the site. Tamron celebrates Mother's Day with a $50 rebate on the Tamron AF 18-270mm VC Lens. Rebate is valid from May 5, 2009 through May 12, 2009 and as usual, the lens must be purchased from an authorized retailer. Here is the Tamron 18-270mm VC Lens Rebate Form. Amazon.com has the Canon LP-E6 Battery in stock. The Canon Spring-Summer 2009 Camera, Lens and Flash Rebates are now available. This program in in effect from May 3 - July 11, 2009. Some great gear is included and the savings on some of these items is big. Once again, these are rebates that everyone can love - they are instant. The Canon Lens and Flash Rebate Form and Canon DSLR Rebate Form are available for download, but as with the other Canon instant camera and lens rebates, the forms are not needed. These rebates are available at B&H Photo and Adorama. New Tamron Lens Rebates are available.